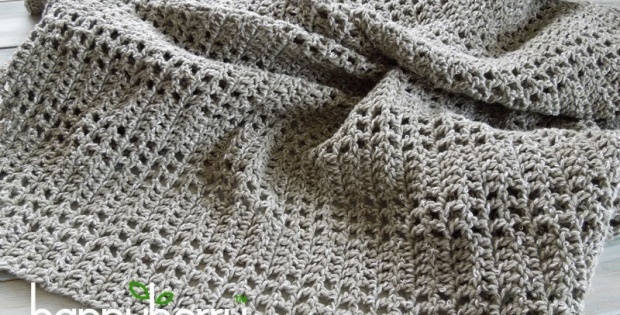 This gorgeous crochet baby afghan or blanket can be made in any size. The original pattern was designed as a baby blanket suitable for a cot bed. However, you can easily make it smaller or bigger to suit your project. The designer responsible for this flexible baby blanket is Laura Eccelston over at the Happy Berry. Following the pattern as is, you should end up with a crochet afghan or baby blanket measuring 50 inches by 30 inches. In metric, the finished baby throw should be approx. 130 cm by 75 cm. To change the size of your throw and to make sure that the mesh pattern starts and finishes correctly, you will need to work to odd units of 5, 10, 25, 35 and so on. The yarn Laura (at Happy Berry Crochet) used, Bergere de France Cherie, may be difficult to get hold of. If you cannot get it in your local yarn store, you can substitute it for a similar yarn. It is a worsted yarn with 19 sts to 4 inches and is a 43% cotton, 50% acrylic and 7% silk mix. You can access the FREE pattern here: Crochet Afghan or Baby Blanket. Laura has also made a great video tutorial which you can work along with.